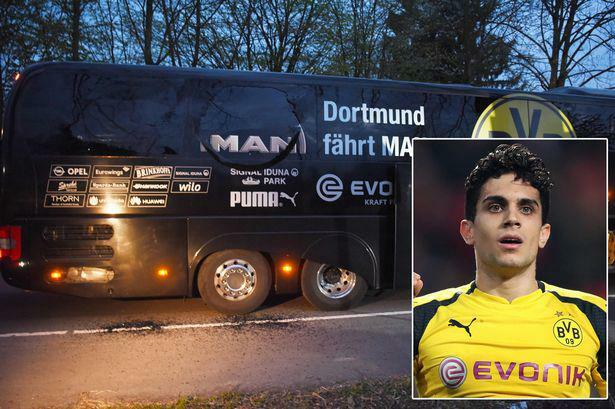 Three explosive devices went off by the side of the bus carrying the German football team Borussia Dortmund on Tuesday night, injuring one player. The incident occurred at about 7.15pm local time in Dortmund’s Höchstem district, approximately six miles (10km) from the club’s stadium, where they were due to play a Champions League quarter-final against Monaco. Police confirmed there were three explosions near the bus, breaking some of the vehicle’s windows. The defender Marc Bartra was injured by shards of glass and was taken to a hospital. He was due to undergo surgery on his injured arm to repair a fracture and remove shrapnel. Later, a fourth, undetonated device was found in the vicinity of the team hotel. Police also revealed they had discovered a letter near the scene of the crime which contained a claim of responsibility for the attack and were trying to authenticate it. » Best European football player: Griezmann, Bale or Ronaldo? » Are Belgium really the best national football team in the world?